November 30, 2012, 3:49 PM · A string quartet = a tiny musical ensemble, capable of drama of soap operatic proportions. 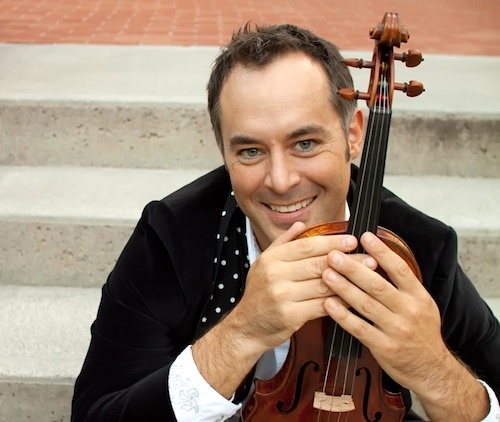 Russell, whom you may know as half of the rock-pop-hiphop-violin duo, The Dueling Fiddlers, was a founding member of the Fry Street String Quartet, in which he played for 12 years before taking a hiatus from the classical world a few years ago. He's been playing the violin and viola since the age of five, when he started in the public schools in Minneapolis, Minnesota, and he has two classical performance degrees from Northwestern University. Currently living in West Virginia, he is also working on an international online release of a new method for learning music at all ages called the HeartStrings Method, and he founded a music school chain called HeartStrings Academy. When I heard that Russell had recently worked as musical coach for actors during the filming of the Hollywood movie “A Late Quartet,” I had to get the scoop about what this gig was like! Laurie: What was your role with "A Late Quartet"? Where did you have to go to do this, and how much time did it take? How did you land this gig? Russell: We filmed in New York City -- I was there with the Dueling Fiddlers doing shows at Town Hall and Le Poisson Rouge. I originally got called for my hands -- to audition as a hand double for Mark Ivanir. I went to the audition expecting to play, and instead was led right onto the set, where the actors were filming a rehearsal scene. The director and a few violinists gathered around a table, and we all laid our hands down next to Mark's. Everyone pointed at my hands, and they were excitedly saying, "Look at those hands!" I felt strangely flattered because my hands looked exactly like Mark's, and I got the job. It wasn't until later that day when one of the producers heard that I had just retired from a 12-year stint with a touring quartet and that I knew all of the Beethoven Quartets intimately. Since the movie centers around Beethoven's Opus 131 Quartet, they asked me if I would work with Mark as a violin coach, both in private lessons and during filming. I also helped Catherine Keener a bit with her viola playing, and at one point I was helping Yaron Silberman, the director, decide where to start and stop a few performance clips. It gets really intense on the set when literally hundreds of people are waiting around while the director decides what to do next. I really got into the pressure-cooker aspect of this process, and I think I hit my pinnacle of movie-making at one point, when I jumped up and yelled, "Cut!" and something like, "Let's take it from the top!" I never expected to find myself (however briefly) directing Phillip Seymore Hoffman and Christopher Walken! Laurie: What was the biggest challenge for the actors, in learning the instruments? How much did they have to learn in order to play their roles? What was your biggest challenge as a teacher? Russell: The actors' goal was to actually look like they were playing Beethoven Op. 131 in several scenes, and I must say, playing Op. 131 is hard enough for someone who has played violin all his life! The actors took the challenge really seriously and put a lot of effort into learning how to play. My hat is off especially to Mark Ivanir, because he was hired just before the movie began shooting, so while the other actors had several weeks of lessons, Mark was learning how to hold the bow as shooting began! We had a lesson or two per day, for two weeks, and that was in addition to sometimes 14-hour days on the set. Laurie: Did they have other questions for you, about being a musician, besides questions about how to hold and play the instrument? What are some of the things they wanted to know about? Russell: We talked a lot about the character of the music and the mood of each particular passage, as well as how the events of the movie might affect the performer's state of mind in this particularly challenging time for each member of the quartet. It was oddly similar to discussing the Beethoven in a real quartet rehearsal! The actors were trying to get inside Beethoven and grappling with its complexity while marveling at its ability to express complex emotions. Laurie: How do you feel about non-musician actors playing musicians in a movie? You played in a professional quartet for more than a decade -- how accurately do you think the movie portrayed life in a string quartet? Russell: At first I found it funny because they were struggling so much to play the instruments, and for the string players coaching, it was hilarious at times. But in the end, I think it really worked. The movie really captured for me what it feels like to be in a professional string quartet. The members of a quartet are constantly challenged to give up more of themselves for the good of the group, and the movie portrayed that challenge really well. The movie is about one of the members of a long-standing quartet needing to leave the group, and since I had recently left my quartet, I found myself holding back tears at times when watching "The Fugue Quartet" from the movie grapple with the same thing. It really hit a personal note with me. Laurie: What is the funniest thing that happened on set? Russell: Apparently, Christopher Walken said, "We need more cowbell," at one of the rehearsals before I joined the movie. Too bad I missed that (it's a famous line he used in a skit on Saturday Night Live). Laurie: What did you enjoy the most? Russell: I very much enjoyed seeing the actors work. Even when a scene would end up being shot over and over again, they kept working at it--trying out different things in each take, and often coming up with a dozen different, yet really moving performances of the same scene. "A Late Quartet" uses a recording of Beethoven's Opus 131 String Quartet, performed by the Princeton University-based Brentano String Quartet, which includes violinists Mark Steinberg and Serena Canin; violist Misha Amory and cellist Nina Lee. December 1, 2012 at 02:00 AM · Thanks Laurie! I just was turned on to this by the woman that takes lessons after me. It looks really good and I hope to check it out soon. December 1, 2012 at 04:55 AM · The trailer is unwatchable. December 1, 2012 at 02:44 PM · I'm with Corwin...and I've liked PSH since 'Happiness' came out. They *do* seem to be 'playing' better than is usual though, normally I lose my mind and have to look away when people are acting at playing. The second violinist with 'issues' sorta reminded me of the book by Vikram Seth, 'An Equal Music'. If you want a candy book with a love story and an insufferable protagonist, check that out. All that being said, of course I have to go see it. How we as professionals are portrayed to and by people who don't play has always been strangely compelling to me. You may get a different impression if you check out the various clips of the movie, rather than the trailer. Check out the website below. Seems like an interesting and good movie to me. But while it looks like it's quite well done, I don't find that I get so much out of a movie where I already have lived the part. For me, movies like "Hoop Dreams","Brooklyn Castle" or this one, while all good, aren't worth paying to see in a theater. I prefer to simply play basketball (at least when I was younger lol), chess, or quartets, respectively, and get a more meaningful experience. December 2, 2012 at 09:06 PM · I enjoyed this movie a lot-- it was much better than the trailer. Glad I went! I wrote a review of it here, which addresses the issue of non-musicians playing musicians. A bit of trivia-- my daughter is a student at Juilliard, and while the movie was in production, her string quartet had to interrupt someone who was using a practice room they'd reserved. They were surprised when the practice room door opened and the "squatter" turned out to be Philip Seymour Hoffman and his coach! December 3, 2012 at 04:27 AM · I hate to say it, I saw the movie the first showing that hit the Bay area. I thought the simulated playing was about the worst I've ever seen in a movie (and I've seen some from way back in the 1940s)- and I thought many plot elements were pretty much off for "real" string quartet professionals. However I must admit that although I started playing in string quartets way back in 1948, I'm no professional. I also have to add that I really respect the bodies of work of all the actors in this movie - and the New York City backgrounds are wonderfully filmed and integrated. at times it is a beautiful movie to watch. For me the best part of the movie occurs during the final credits when Beethoven's Op. 131 is heard without distractions. December 3, 2012 at 05:00 AM · The Brentano has got to be one of my favorite quartets around right now. I absolutely love their playing! December 3, 2012 at 06:27 AM · Thanks or sharing your review, E. Smith!